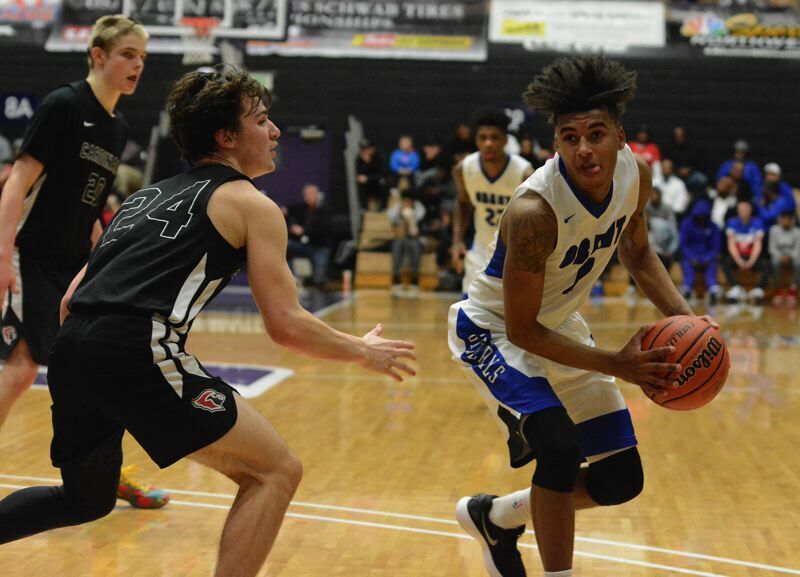 When Darius Guinn's 3-point shot went in off the backboard to put Grant up by 18 points early in the third quarter of Friday's Class 6A boys basketball semifinal, it seemed the Generals might sail into the championship game. Turns out, there was a lot more work to do — including overtime. 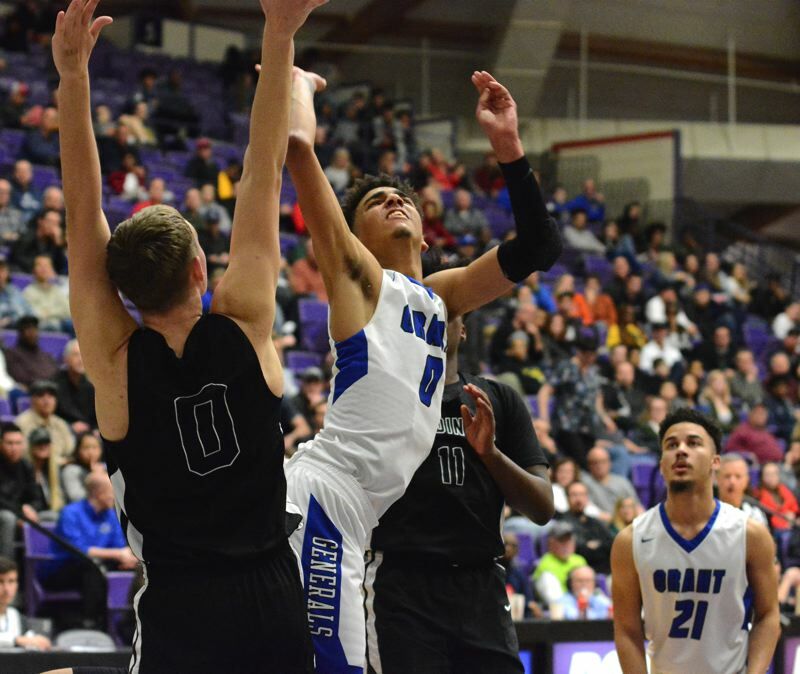 Lincoln took a one-point lead late in the fourth quarter before Grant made one last surge in the extra session to win 83-75 at Chiles Center. The win earned the No. 2-seed Generals a fourth shot at No. 1 Jefferson this season — this time with a state championship on the line. And it was at the line that Grant kept its quest alive. The Generals, an inconsistent foul shooting team at times this season, were only 9 of 18 from the line in regulation. But they made eight in a row over a 100-second span of overtime to finally turn back the Cardinals' challenge. "That's a sign of determination," Grant coach Robert Key said. "Missed some free throws in regulation, but at the end of the day, when we needed makes, the kids stepped up and knocked them down." Grant (24-4) and Jefferson (26-3) tangle at 8:30 p.m. Saturday for the Oregon School Activities Association title. The Democrats are shooting for a second consecutive 6A crown. The Generals are shooting to avenge three close losses to Jefferson this season. 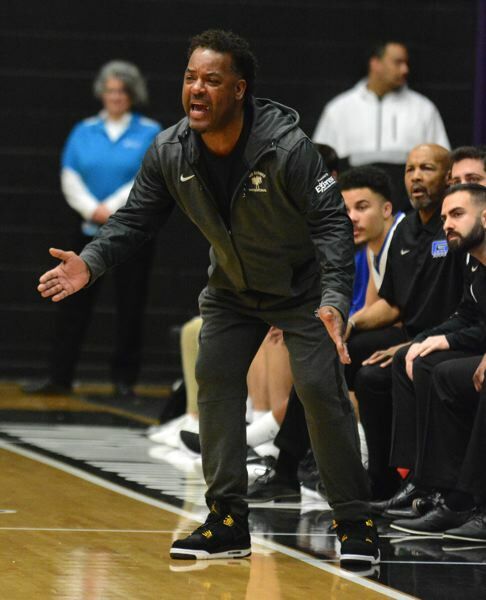 Lincoln (18-10) will face Barlow (19-9) for third place at 6:45 p.m.
Aaron Deloney of Grant scored six of his game-high 32 points in overtime on Friday. After he made one of two foul shots for a 72-71 Grant lead with 2:26 left in OT, the junior guard came up with a big steal from Lincoln's Bryce Sloan and hit a pair of free throws to put the Generals up three. Rasheed Butler — who sank two big 3-pointers in the fourth quarter to help spark the Lincoln rally — missed contested shots on the next two possessions. Ty Rankin, Kelton Samore and Damon Hickok each stepped up and knocked down two free throws to grow the Grant lead to nine points inside the final minute. Free-throw shooting, Samore said, cost Grant in each of its losses to Jefferson. To make them in overtime of a state semifinal "just shows how resilient our team is. We saw the moment, and we said we are not losing this game." The five starters did all of the scoring for the Generals, and all reached double figures. Samore finished with 16 points, seven rebounds and three blocks. Rankin had 13 points, four rebounds and three assists. Hickok had 12 points, eight rebounds, six assists and no turnovers. Darius Guinn, who fouled out in the fourth quarter, had 10 points, four rebounds and two steals. Hickok's contribution went beyond the stat line, as the junior did much of the work defending Sloan. "Stay attached to him as much as possible, make every shot as hard as I can for him," Hickok said of defending Sloan. Lincoln's all-league guard finished with 23 points, 10 assists and seven rebounds. His assertiveness with the dribble helped ignite the Cards' rally, and Sloan had 16 points, six assists and five rebounds after halftime. Hickok said teamwork on defense was critical to defending the Cardinals. "When we talked, we were able to switch screens perfectly and were able to step up on 'D' and shut them down, but when we didn't communicate, they got open shots and connected on them," Hickok said. The shooting of Grant's guards early in the game made it seem the Generals' night. Grant shot 56 percent in the first half, making 6 of 11 3-pointers. Deloney, 5 of 6 from 3-point distance in the game, was 4 for 4 in the first quarter as Grant led 23-16 through eight minutes. Lincoln also had scoring balance. Aidan Anastas finished with 20 points and six rebounds. Addison Phillips had a double-double with 11 points and 10 rebounds. The Cardinals outscored the Generals 22-9 in the fourth quarter to force overtime. "I think it was mostly on us," Samore said. "We just took some plays off and got a little too comfortable and let them slowly get back in the game. "They're a great team, as they showed today, but I think we just got a little too comfortable." An 8-1 Lincoln run that included a driving layup from Sloan and a 3-pointer from Butler helped give the Cardinals the lead — at 68-67 on two Phillips foul shots with 1:29 on the fourth-quarter clock. Hickock responded by getting into the lane and drawing a foul — then hit both ends of a one-and-one to put Grant ahed 69-68 with 1:16 remaining. Anastas tied the score with a free throw with 52 seconds left. Grant played for the final shot, and Deloney drove into the lane in the final seconds but had the ball slapped away by Sloan. 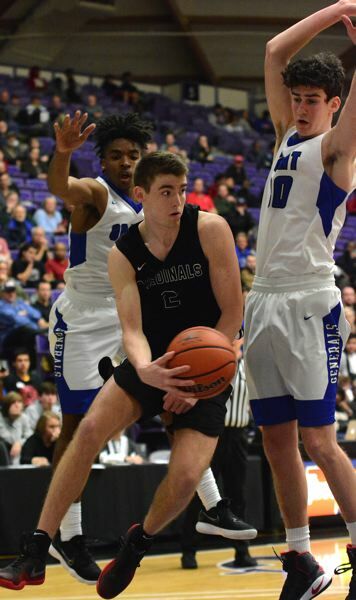 After Sloan missed a 3-point shot, Deloney drew a foul and made the first of the string of free throws that led the Generals — at last — to their championship showdown with Jefferson. "We wanted them," Hickok said of earning one final shot at the Democrats. "That's what you saw in overtime. We pushed through and gave it all we got because we wanted them really bad."